Scott Hinkle remembers. During his first season back as LHS head coach, a mercy rule was offered his way. At the time officials asked if the LHS coach wanted to use a running clock in a game at Hays. Hinkle bristled at the possibility before this was a WAC rule as it is now. So with LHS up thirty over #2 Hays in the fourth quarter, the game used a running clock in the fourth quarter of Liberal’s 70-42 win in the Big House. Hays jumped out to leads of 11-5 and 14-7 before the Redskins rallied to tie the score at 16-16 after one. Liberal took off in the second quarter taking a 39-21 lead on the way to a 39-25 halftime lead. LHS led 62-32 after three. Kaiden Bigham pumped in a career high 15 and made five three pointers. Markalyn Eatmon, Kylan Thomas, and Deladris Green scored 11 a piece. Seventh ranked 5A Liberal is 7-0 for the first time since 2005 as they open with a WAC win. Second ranked 4A Hays is 5-1 and 0-1 in the WAC. 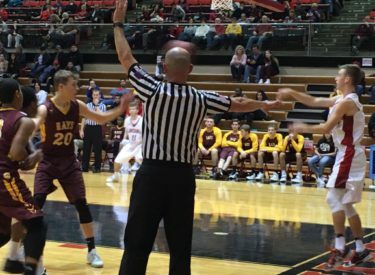 The Redskins host Garden City Tuesday night at about 7:45 in the Big House airing on 1270 and kscbnews.net.